The year 2006 will be a period of tremendous challenges for Africa's development. Through a confluence of national and continental homegrown programs, bilateral and multilateral initiatives and the doggedness of the civil society in the continent and the West, the development needs of Africa are now a major concern of the global community. Since the beginning of the new millennium, organized efforts to jump-start development in Africa have reached a crescendo. The creation of a new African Union and the articulation of a continental development platform, the New Partnership for Africa's Development (N.E.P.A.D. ), represent a historic commitment by Africans to accelerated development in the continent. The Group of 8's annual meetings in the new millennium continues to focus on development initiatives in Africa. Unprecedented street protests against the effects of globalization, especially in Africa, and orchestrated mega-concerts around the world focusing on "making poverty history" have ushered in a new generation of development activists. In this paper, I briefly discuss the major challenges for Africa's development in 2006. 1. 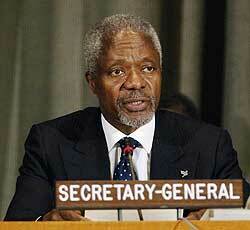 Kofi Annan is in the last year of his 10-year tenure as secretary general of the United Nations. Quietly but with fierce determination and the refined manners of an accomplished diplomat, Annan made Africa the centerpiece of his tenure. The impending exit of the secretary general from his high office will remove an African who had become a very effective advocate for accelerated development in the continent. Africa will lose the services of a compatriot who is at home simultaneously nudging both African leaders and their Western counterparts to commit more resources to verifiable development initiatives in the continent. 2. The ongoing Darfur crisis in Western Sudan will show no signs of abating and may destabilize neighboring nations such as Chad. The Darfur crisis will remain a yardstick of the Africa Union's resolve to take care of continental problems. The crisis will also be a major test of the U.N. Security Council's commitment to ending what may be an unfolding genocide. Chad, one of the most impoverished nations is under tremendous financial and security stress from millions of Sudanese refugees in its midst, largely from the Darfur region. 3. Dangerous conflicts may get out of hand in various parts of Africa. The renewed saber rattling between Ethiopia and Eritrea may escalate into another border war. Conflicts in the Democratic Republic of the Congo (D.R.C. ), Northern Uganda, Northern Kenya and Ivory Coast, to mention only a few, may escalate in 2006 due to a combination of simmering political, economic and religious tensions in the affected areas. 4. Famine and hunger are on a dangerous march in a large swath of Africa. Millions of Africans face possible starvation in Africa in 2006. In Southern Africa, at least 10 million individuals face possible starvation from prolonged drought and famine. In West Africa, more than 5 million people face hunger and starvation. In Kenya, more than 2 million citizens are urgently in need of food. The attendant loss of cattle and other precious livestock, and limited farming activities in parched farmlands of the affected areas is now responsible for a vicious cycle of drought, famine and hunger. 5. H.I.V./AIDS, TB and Malaria will continue to claim millions of lives. These three conditions will continue to wreck havoc on the health of individuals and the economy of affected societies. The health system of many African nations, especially in Southern Africa will continue to be under severe pressure from the impact of the three conditions. Remedial efforts, domestic, regional and international, are likely to remain hampered by financial, technical, logistics, political and governance bottlenecks. 6. Political transitions will remain haywire. Many countries will either begin or conclude delicate political transition programs in 2006. These countries include the D.R.C., Uganda, Zambia, Ivory Coast, Liberia, Kenya and Nigeria. Tensions are likely to run high in Uganda no matter who wins the presidential election of 2006. Kenya's democracy is at a crossroads as the country's powerful presidency leaks its wounds after a humiliating defeat in a recent national constitution referendum. Zambia must conduct a presidential election in the face of bitter personal rivalry and political brinksmanship by major political contenders. The situation in Ivory Coast remains volatile regarding the conduct of a new presidential election and the participation of the armed group in the North in a reconstituted national government. Ivory Coast for all practical purposes will remain a country bifurcated into two mini-states. The first female president in Africa, Ellen Johnson Sirleaf of Liberia will have her hands full in placating multiple rebel groups, providing badly needed basic infrastructure and putting battle-hardened teenage soldiers back in school. The ongoing political rumbles in Ethiopia over the 2005 elections may escalate if Western donors impose sanctions on the national government. The political temperature in Nigeria will rise dramatically as politicians gear up for a do-or-die electioneering campaign for the nation's presidency in 2007. 7. The economy of most African nations will continue to be a struggle. According to the U.N. Economic Commission for Africa and the World Bank, Africa's growth rate will be lower than the 7 percent required to achieve the Millennium Development Goal of halving poverty by 2015. Many African nations will be under the triple threat of H.I.V./AIDS, famine and grinding poverty. Nations that depend substantially on external funds for national recurrent expenditures may be particularly at risk if external donors decide to withdraw financial support. The economy of Uganda, Malawi, Zambia and Kenya are particularly at risk if external donors have reservations over political stability and governance in these countries. Chad's standoff with the World Bank if not resolved quickly may create a major economic emergency in the country. 8. The continent will continue to be on pace to miss most of the milestones set aside in the Millennium Development Goals for 2015. I am not aware of any major initiative in 2006 that will jump-start efforts to halve poverty in Africa. Nor is there any evidence that robust investments in education, water supply or proper sanitation is in the works. Needed investments in H.I.V./AIDS, TB and Malaria remedial efforts are also unlikely to materialize in enough scale in 2006 to make a difference in organized efforts to meet the milestones. 9. Governance will remain a major challenge, and external donors may take unilateral, punitive action. The current impasse between the government of Chad and the World Bank over how to utilize proceeds from the exploration of oil in Chad is a case in point. Kenya, Uganda, Malawi, Zambia, Ethiopia, Eritrea, Equatorial Guinea and São Tomé and Príncipe could be litmus tests in 2006 regarding the assertions of political sovereignty by African governments and the insistence on verifiable governance reforms by external donors. Concerns over governance reforms may also bring to a crawl the already slow progress in the ongoing trade negotiations between rich and poor nations under the auspices of the World Trade Organization. It is unlikely that poor and rich nations will reach a deal on agricultural subsidy in the West in 2006, what with mid-term elections in the United States and impending political transitions in key European countries. It is also unlikely that 100 percent debt relief will be granted to all poor nations in Africa in 2006 by the Group of 8 as the Breton Woods institutions are likely to balk at more expansive debt relief and Western leaders adopt a wait-and-see attitude on governance reforms in countries already granted substantial debt relief. 10. The human resources capacity crisis in Africa will continue to get worse. The ongoing human resource crisis in the health sector, engineering and professional services will continue unabated as experts leave the continent in droves. The combination of poor pay, poor working conditions, political instability, macroeconomic gyrations and worsening security of lives and property will force many African professionals to vote with their feet out of the continent. Organized efforts by governments, the private sector and the civil society in Africa and the West to address this problem will at best, still, be in its earliest stages in 2006. The 10 challenges for Africa's development discussed in this article are not insurmountable. However, these challenges require sustained policy and program attention by major stakeholders in Africa's development. These stakeholders include African governments; continental institutions in Africa such as the African Union, the U.N. Economic Commission for Africa, the African Development Bank, and N.E.P.A.D. (slated to be fully integrated into the African Union); bilateral and multilateral development partners; the organized private sector; the professional and service delivery organizations; private foundations that finance major global alliances dedicated to eradication of diseases in Africa such as the Gates Foundation; and, the civil society in Africa and the West. It is the responsibility of all stakeholders in Africa's development to turn the 10 major challenges discussed in this paper into opportunities for more effective and efficient action on the ground in Africa, to save lives, enhance quality of life, and create conducive environments for Africans to reach their full potential. Chinua Akukwe teaches graduate courses in global health at the George Washington University School of Public Health, Washington, D.C.